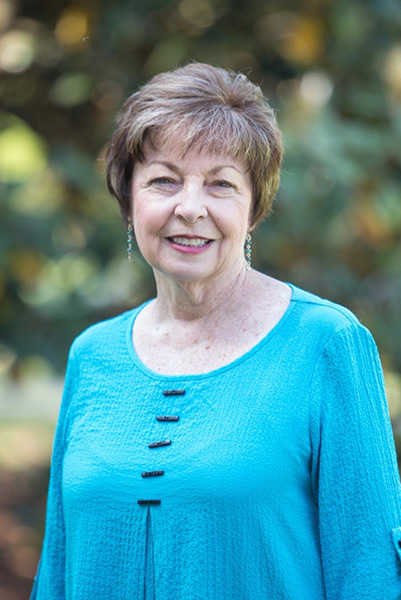 Dr. Patti Wood is a professor in the curriculum and instruction department of the School of Education at Samford. She has served as the director and faculty advisor for the M.S.E. degree in gifted education since 2006. Dr. Wood serves on the executive board of the Alabama Association for Gifted Children and is active with the National Association for Gifted Children. She provides professional development to school districts on how to meet the needs of gifted learners, particularly regarding reading instruction for gifted/advanced readers and differentiation. Hilsmier,A. S., Wood, P. F., Carson, C., Dutton, K., & Johnson, J. (2014). Function-based thinking: Teacher experiences in secondary classrooms. The Educational Collaborative, 4(2), 1-13. Wood,P. F. (June 2013). Young gifted readers + great books = grand conversations. NAGC Early Childhood Network Newsletter. Wood, P. F. (2009). Growing young gifted readers: Ideas for both parents and teachers. Understanding Our Gifted, 21(3), 6-8. Wood, P. F. (2008). Reading instruction with gifted and talented readers: A series of unfortunate events or a sequence of auspicious results? Gifted Child Today, 31(3),16-25. Wood, P. F. (2007). Reading instruction with gifted and talented readers: The intersection of student perception and teacher practice. Quest, 18(2), 2-7. Using Costa’s Levels of Questions to Tier Instruction for the Common Core State Standards, National Association for Gifted Children, Annual Conference, November 2013. Young Gifted Readers and the Common Core State Standards, National Association for Gifted Children, Annual Conference, November 2013. At the Corner of Creativity and Affective Needs, National Curriculum Network Conference, The College of William & Mary, March 20, 2013. Young Gifted Readers + Great Books = Grand Conversations, National Association for Gifted Children Annual Conference, November 2012. Action Research: Becoming a Teacher Researcher. National Association for Gifted Children, New Orleans, November 2011.